Brasil’s right-wing march under a banner of anti-corruption but the protests of the past weekend illustrated what is actually a fresh manifestation of Brasil’s ongoing class conflict, with an undercurrent of racial tension and a dash of anti-communist hysteria. 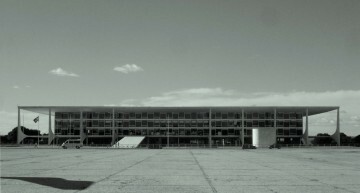 The Petrobras scandal is a primary concern of many Brazilians today, across the political spectrum, but nebulous innuendo of corruption has long been used around the world by the extreme right in order to frame the left, it is certainly not unique to Brasil, but now far more acute. We explore the background to current events in more detail here. Straight comparison of numbers between different protests, with different aims, on different days, is quite futile, especially in São Paulo, a city with a massive right-wing majority, in a country of very diverse social realities and over 20 million inhabitants. However, there are are other details of interest about these two opposing demonstrations, for example, the coherence of their messages, and in particular the enormous disparity in how estimates of attendance were arrived at & subsequently reported. 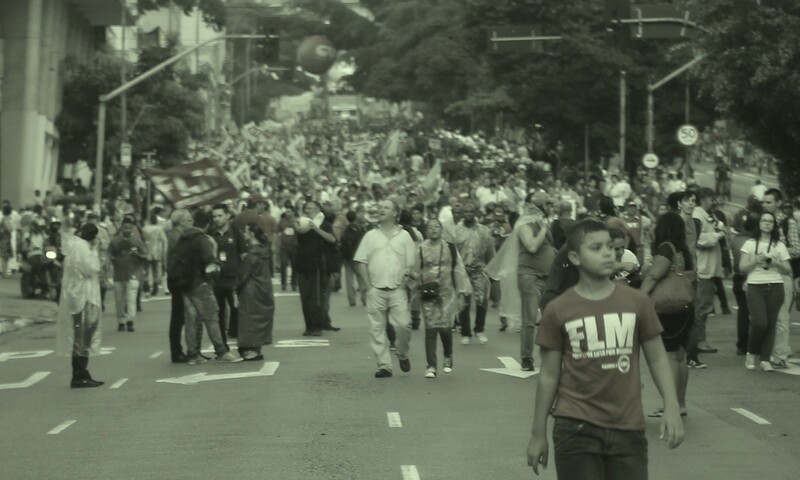 There were other smaller parallel demonstrations in other cities on both days, but we will focus on São Paulo, where we had sources present on both days, for the purposes of this analysis. 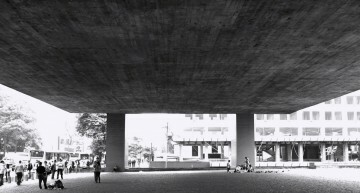 13/3 CUT – The largest Trade Union in Brazil, close to the Workers Party, plus other left-wing social movements such as MST, the landless workers movement, & FLM, a housing organisation. Relatively minor use of social media. 15/3 Vem Pra Rua, Movimento Brasil Livre, a young libertarian group with reported links to the Koch Brothers Atlas Institute, plus other smaller right-wing & extreme-right groups. Massive presence on social media. 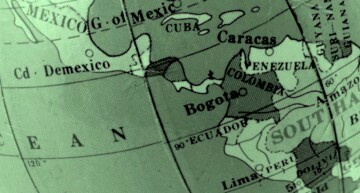 15/4 MTST, various Trade Unions, Far-left parties such as PSOL & PTSU. Actually a combination of two protests. 13/3 Workers’ Rights, Land Reform, Housing Rights, Pro-Democracy, Political reform as solution to corruption, including ban on corporate donations to political parties. Defence of Petrobras from internal & external attack. Criticism of Government’s austerity policies. Anti-Impeachment. Banners in Portuguese. 15/3 Anti-Corruption, Anti-PT (Workers Party), Pro-Impeachment of Dilma Rousseff plus more extreme messages such as calling for military intervention, or even return of Dictatorship. Banners in English & Portuguese. Most wore Brazil football shirts and carried National flags rather than party or organisation. 12/4 As 15/3, although a survey conducted by academics at USP showed that conspiracy theories & misinformation were far more widespread than thought. The survey can be found here. 15/4 Billed as “Against the Right for more Rights”. This protest was specifically aimed at PL3330/04 – a law which has been proposed for a decade but which the Right, using their current political opportunity, are now trying to push through congress. The law is very unpopular, dismantling much of the worker protections Brazilians have enjoyed for decades or more. It specifically legalises outsourcing of work. However, media coverage of the law and its implications has been minimal. Many surveyed on 12/4 for example didn’t know about it, which indicates a serious failure of media. 13/3 As many of the attendees were from the poor periphery, CUT and other groups laid on some buses to bring them to the centre of the city, a trip which can be extremely daunting on Public Transport. 15/3 The Sao Paulo State Government, run by opposition PSDB, laid on extra metro trains and opened turnstiles to assist protesters in getting to the demonstration. Often the Sao Paulo metro is extremely crowded, and many protesting seemed not to be regular users of it. 12/4 As 15/3 but with addition of Chemical Toilets on Avenida Paulista provided by Sao Paulo State Government. 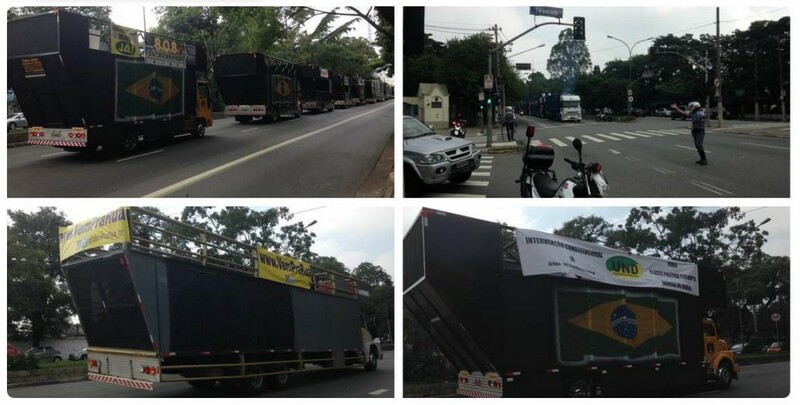 At 11am, prior to the event, a convoy of 20 sound trucks, bearing banners such as “SOS Forcas Armadas” alongside “Fora Dilma” & “Vem Pra Rua” was photographed en route to the demonstration. 15/4 Trianon-Masp station entrance was shuttered. No organised provision of State Government facilities. [VIDEO] Guillherme Boulos of MTST addresses crowd on Avenida Paulista. 12/4 Protesters could be seen taking photographs with Military Police. 15/4 More tense than 13/3, the march took an unexpected diversion down Rua Oscar Freire, in the Jardins neighbourhood – which was confrontational as it is effectively ground-zero for the right-wing in Sao Paulo, whose exclusive retail stores locked their doors as it was passing. 13/3 Almost non-existent in media prior, and few international outlets gave sent anybody to observe at all. CNN did send a freelance field producer who tweeted an early estimate of a few thousand, repeated a rumour that attendees had been paid, and Chavista-like innuendo about “bussed in” protesters. 15/3 This is most crucial difference between the two; omnipotent Globo TV and Folha de Sao Paulo both appeared to be actively promoting this one for some weeks prior. On the day itself, rolling coverage of the march on a sunny Sunday afternoon brought extra waves of attendees up to Avenida Paulista, many joining from the adjacent wealthy Jardins neighbourhood. 12/4 Brazilian media such as Globo again promoted the protest to the point that it looked like an orchestrated Coup attempt. On the day of the event they did everything they could to make the numbers look larger, for long periods running a single cropped shot of an intersection on Avenida Paulista, for example. Internationally, outlets like CNN followed their lead. Although most quality media indicated the drop in numbers, the discredited PM estimates were still often used. 15/4 Barely any coverage at all, local or international. Police quickly revised Sunday’s estimates over the space of one hour, rapidly increasing from 100k to 580k to 1 million. Globo and some international outlets reported this figure, but however, as the demonstration came to a close, respected research institute Datafolha released a conflicting, more scientific, estimate of 210k. Comprehensive breakdown of the protests by Datafolha can be found here, including the telling statistic that 82% of protesters on 15/3 had voted for the defeated Aecio Neves in November’s election. This figure was then picked up by some media, but many continued with the estimate of 1m in São Paulo and 2m nationwide, figures which for anyone who attended the enormous protests of June 2013, did not seem credible. 1m people on Avenida Paulista would have required 6 attendees per square metre and this article about crowd numbers in Sao Paulo explains in more detail, how these numbers can be calculated accurately. Update: Again with April’s protests the disparity between Police estimates of Left & Right wing protests are both telling & troubling. There was however no doubt 15/3 was massive demonstration, the discontent and hostility towards Rousseff & PT that motivated it are very real. Although there were far-right elements present on 15/3 the protest should not be defined by them – most were moderates in a show of frustration that their candidate didn’t win at the ballot box, and disgust at corruption. 13/3 was also massive, yet belittled by media. There are actually some coincidental similarities with the Marcha da Familia com Deus pela Liberdade in 1964, where a figure of 1 million attendees was reported, with later analysis indicating 200k. 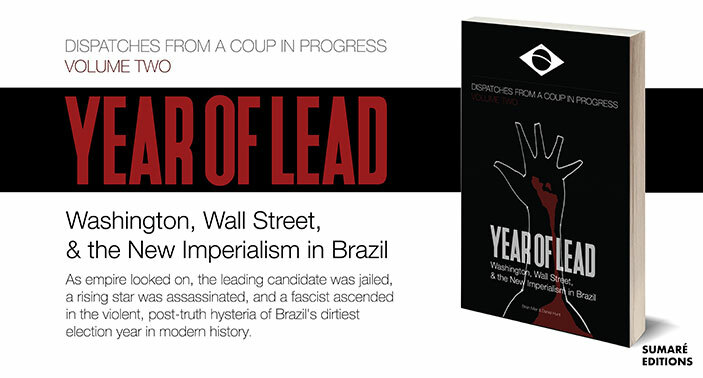 That protest in São Paulo gave the coming coup d’etat which deposed President Jango Goulart the appearance of majority support. Many on the Brazilian right, even Aecio Neves himself, still refer to that coup as a “Revolution” or that it “defeated communism” & “saved democracy”. At the march on 13/3 the situation was opposite, probable attendance was divided by 5 in the Police estimate, whereas on 15/3 it multiplied by same figure. Such enormous discrepancies in the estimates were also observed in January between Police estimates at Left Wing and Right Wing demonstrations. Sao Paulo Military Police are controlled by the Opposition PSDB’s State Government, and Governor Alckmin called the 15/3 demonstration “a memorable day in Brasil’s democratic history”. 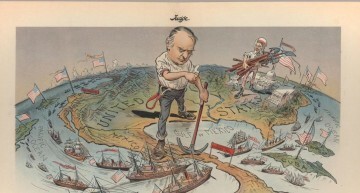 In conclusion, there is no quick fix for Brasil’s insitutional crises. Many present at the Anti-Rousseff demonstration do not understand the impeachment process, and believe that their defeated candidate Aecio Neves will assume the presidency should she be impeached. The corruption will be present regardless as it is entrenched & cross party. Conversely, Political Reform as advocated by protesters on 13/3 looks objectively like a potentially more viable route towards a cleaner Brazilian political system to the benefit of all. However it is also an initiative that is actively opposed by the very forces who supported and promoted the demonstrations on 15/3 as detailed in this discussion with Chico Alencar & Marcelo Freixo of PSoL. 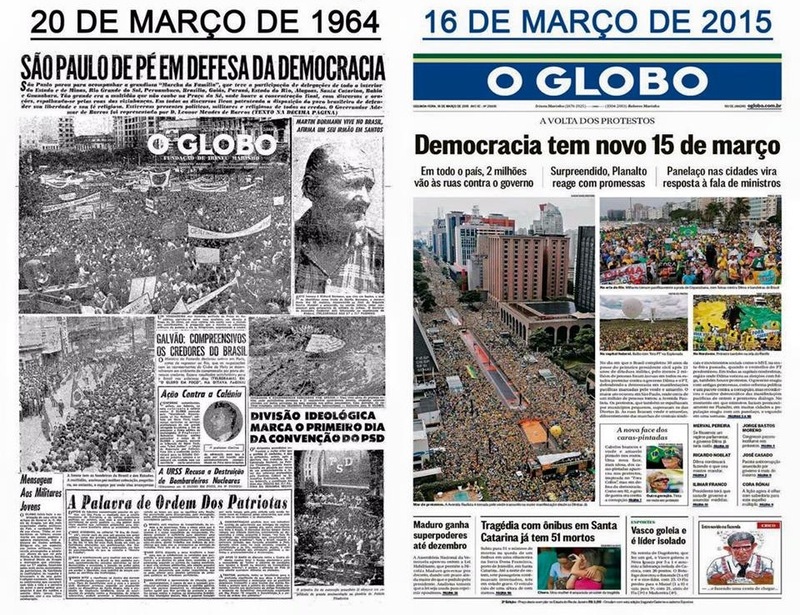 Echoes in the Echo Chamber: Brasil, Elections, Media & the Ghosts of ’64.